Guests dining by the vines. Submitted. Join Parallel 44 Vineyard & Winery as they celebrate summer with Friday evening and Saturday afternoon entertainment. During the Friday night Dine by the Vines Series, enjoy food, music and wine while overlooking the vineyard. 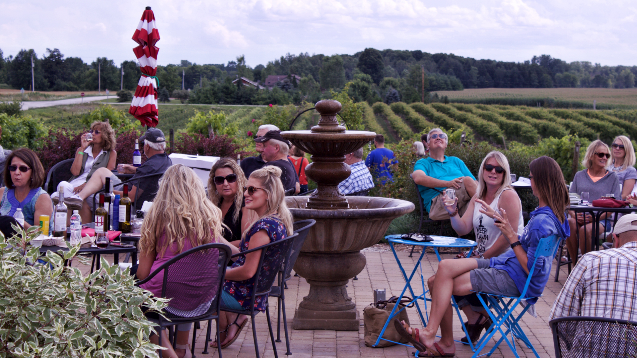 Grab some chairs and head out to the winery for a Saturday afternoon of wine and music on the patio during Music by the Vines Series. Music by the Vines kicks off June 16, 3:30 – 6 pm, and continues through Sept. 1. The Dine by the Vines series begins June 29 and continues through the summer on select Fridays from 5:30 – 8pm. Wine sampling is available during both events for $5 and includes a wine glass. Food is available for purchase from local food trucks on Friday evenings during the Dine by the Vines series. No reservation is required. For more information and a complete list of dates, performers and food trucks visit Parallel44.com.